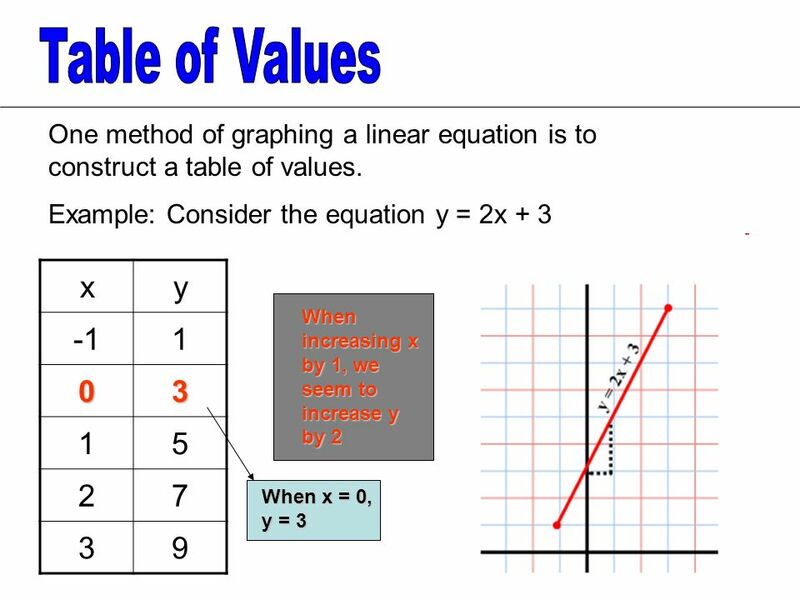 3 The table and graph suggest another method of graphing a linear equation. This method is based on two numbers. The SLOPE This is the coefficient of x when the equation is in the from y = mx + b. In this case, the slope is 2. The y - INTERCEPT This is the value of y when x = 0. In this case, the y-intercept is 3 y = 2x + 3 Slope y - intercept The graph of the equation y = mx + b has slope m and y-intercept b. 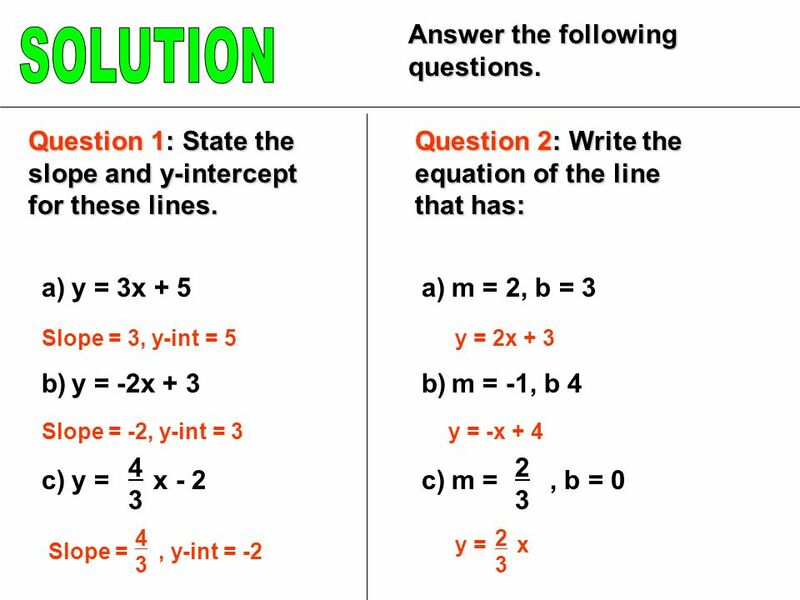 4 The equation y = mx + b is called the slope y - intercept form of the equation of a line. We can draw the graph of an equation in this form without making a table of values. 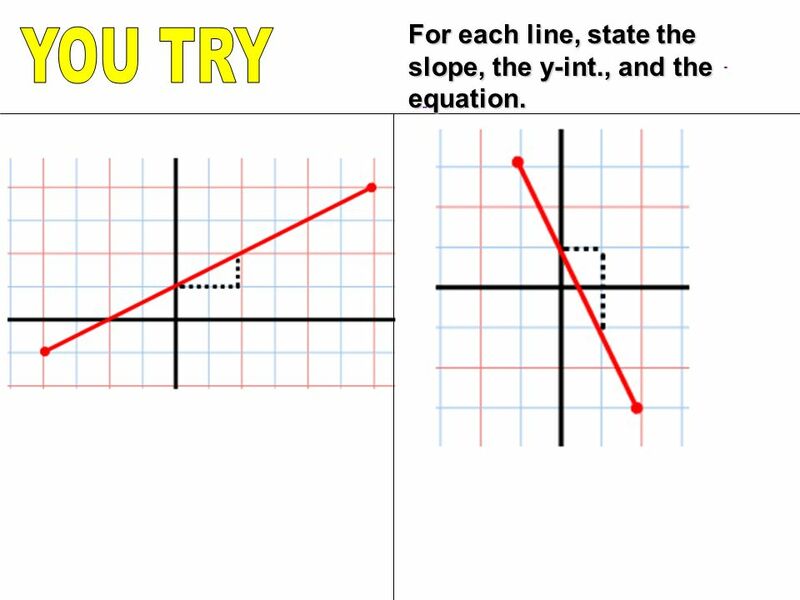 EXAMPLE 1: EXAMPLE 1: Graph this equation: y = -2x +4 Solution: y - intercept is +4 Point (0, 4) Slope = -2 Begin at Point (0,4) and use the slope to draw one point above and one point below the starting point. 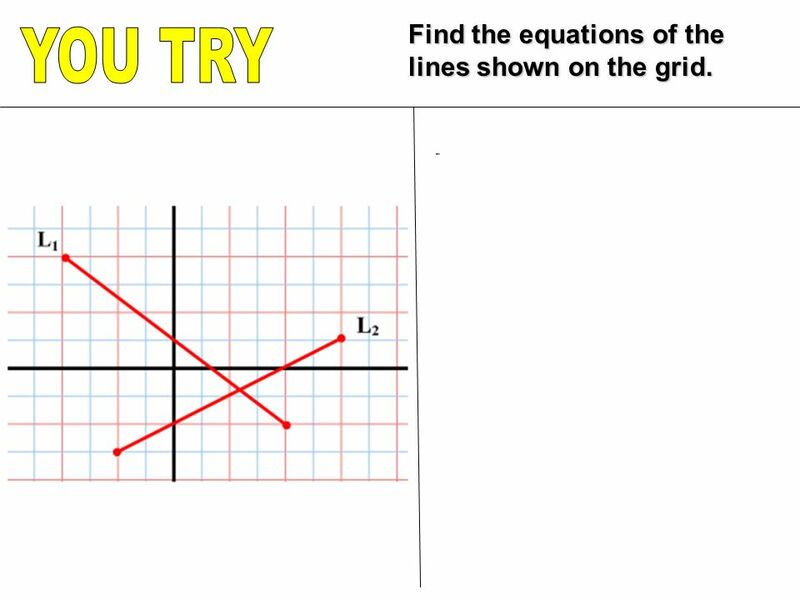 6 Find the equations of the lines shown on the grid. 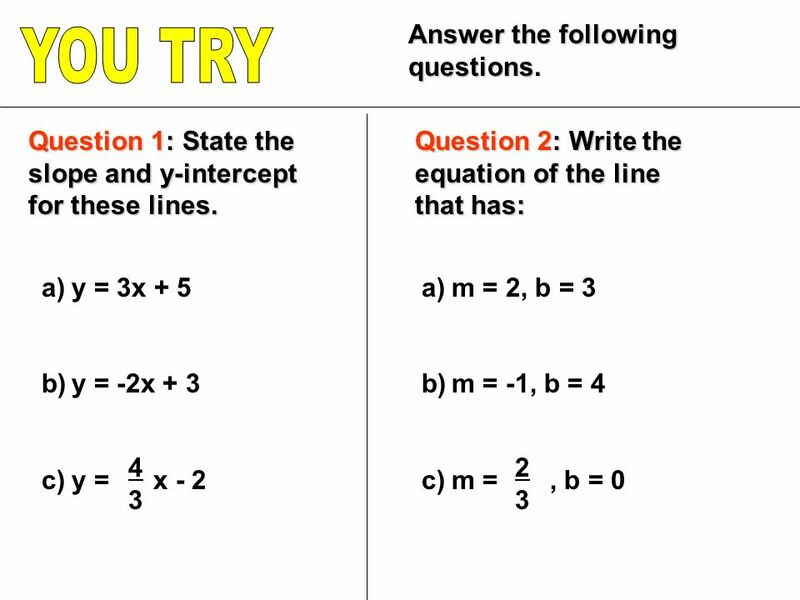 10 For each line, state the slope, the y-int., and the equation. 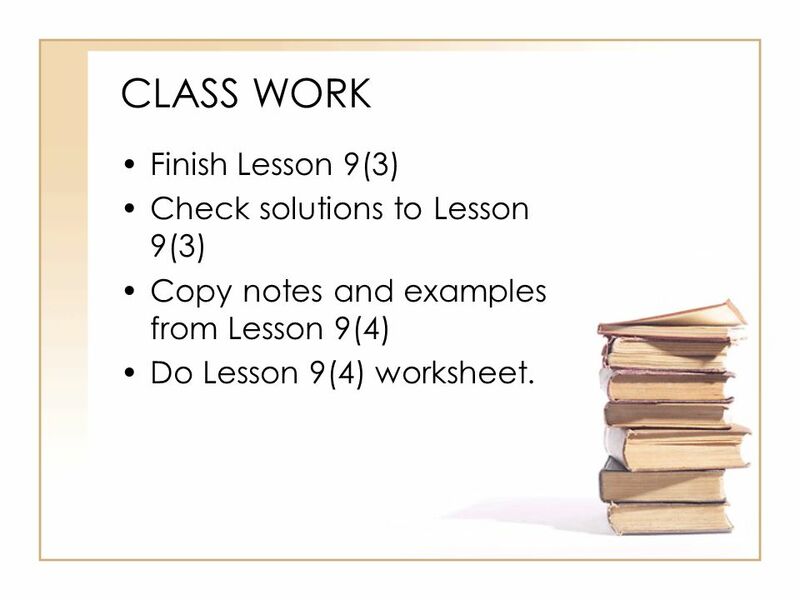 12 CLASS WORK Finish Lesson 9(3) Check solutions to Lesson 9(3) Copy notes and examples from Lesson 9(4) Do Lesson 9(4) worksheet. 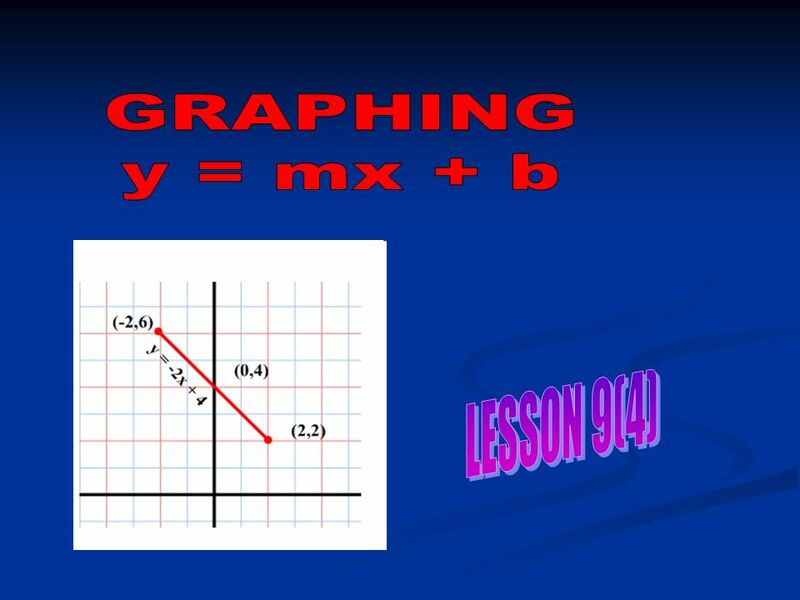 Download ppt "One method of graphing a linear equation is to construct a table of values. Example: Consider the equation y = 2x + 3 xy 1 03 15 27 39 When x = 0, y ="
M. Pickens 2006 Intercepts. M. Pickens 2006 Objectives To learn what intercepts are To learn how to find x and y-intercepts of a graph To learn how to. 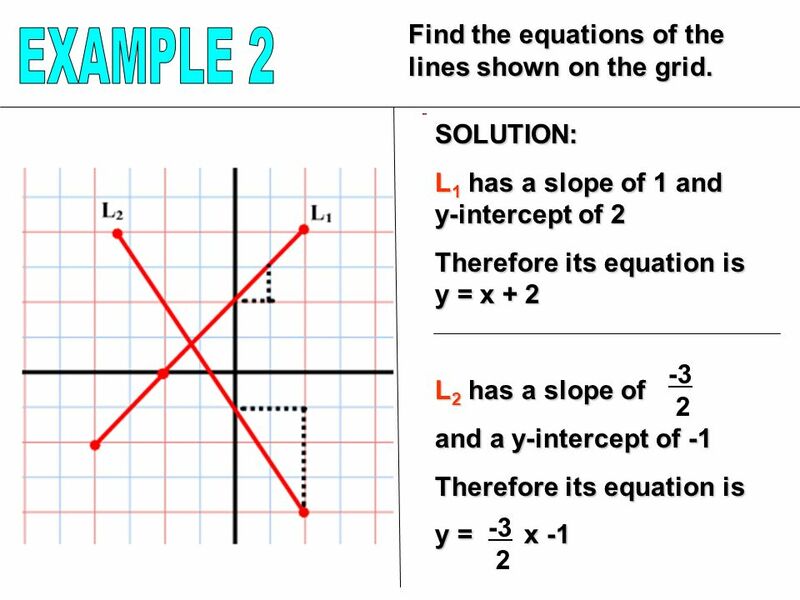 The table and graph suggest another method of graphing a linear equation. This method is based on two numbers. The SLOPE This is the coefficient of x. 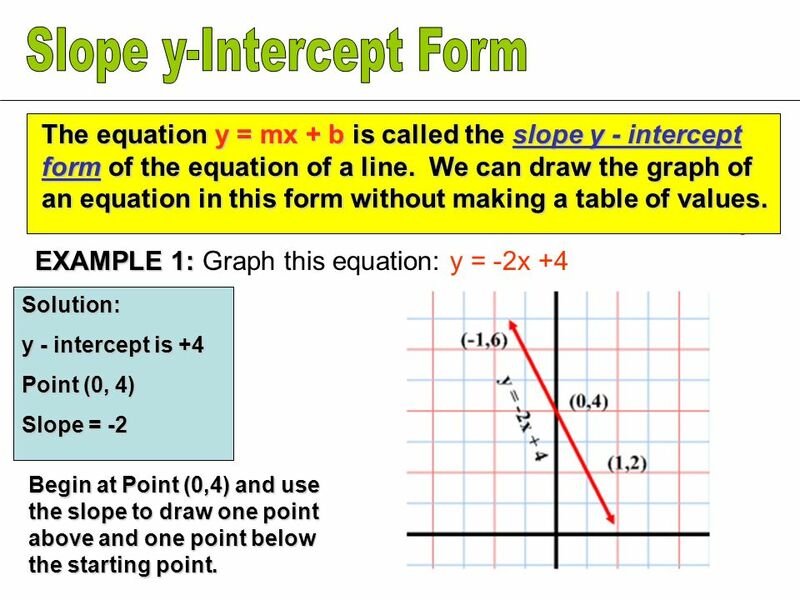 Lesson 5.1 Write Equations in Slope-Intercept Form. 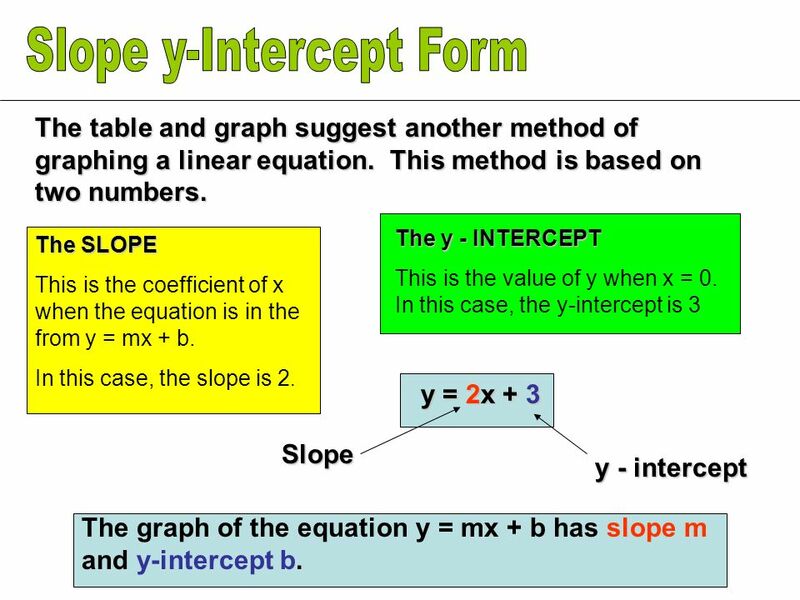 Slope Intercept Form. 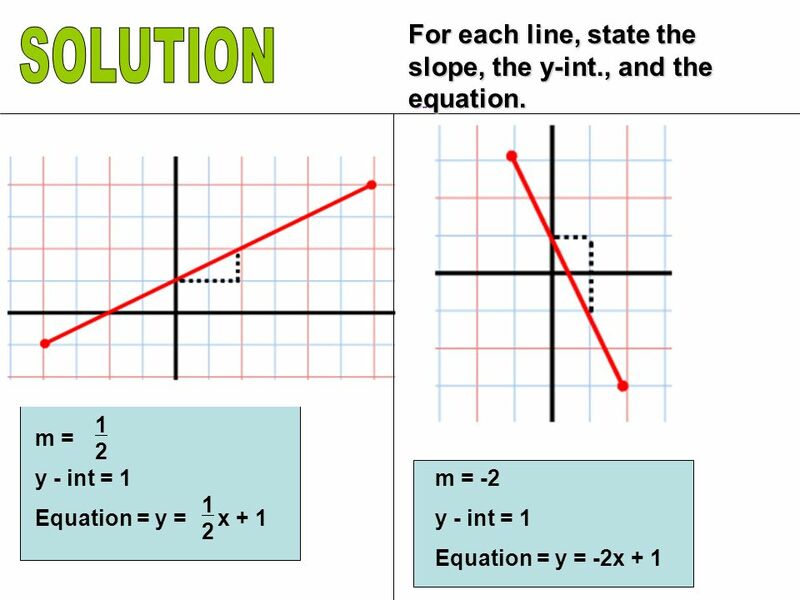 Slope Intercept Form of an equation gives you a quick way to graph an equation. 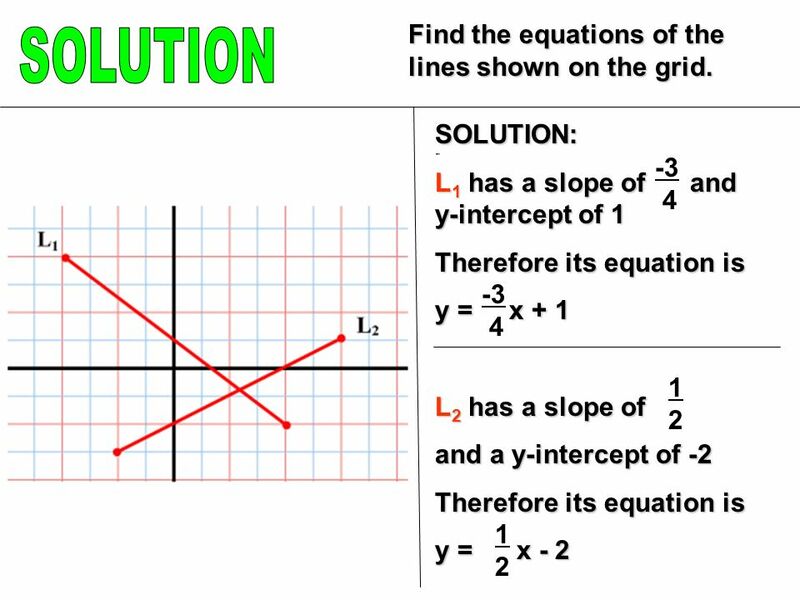 Write linear equations from tables or graphs.